Harry and I got on very well with the whole science fiction crowd with which I was in disagreement in many respects because they thought science fiction was fun. Now, I didn't think it was fun. I didn't think it should be fun. And in my misery, in this one room in Paradise Square, I started to write a novel that would encompass my wretchedness. And that novel is about an England where there are no children, and so the place gradually falls apart in misery and wreckage. And while I wrote that book, I thought, oh God, this is so miserable, no-one's ever going to want to read it. I sent it to Faber, they published it as science fiction and it became a great success... [Greybeard]. This book written in misery, it seemed as though it had echoes all over the place. And after all, I was not the only person who was miserable or whose marriage had broken down, or had lost their children. And so, Deathworld [sic – should be Greybeard] or whatever it was called, became a great science fiction success on both sides of the Atlantic. Really strange how things happen. So, I was able to buy my way out of this little room and I bought a small house from someone who was working on the Oxford Mail, but was then leaving. And he had a house in Marston Street; it was a terraced house. And Marston Street ran between Iffley Road and the Cowley Road, and I paid him I think possibly £3000 for it. It was a nice little place. 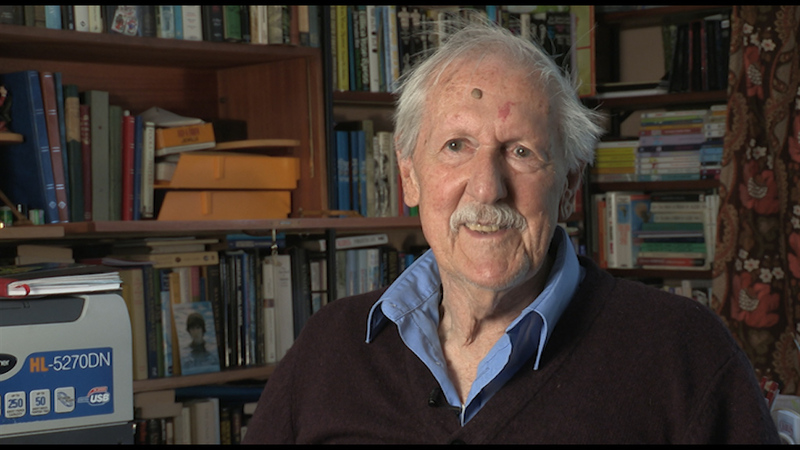 Brian Aldiss (1925-2017) was an English writer and anthologies editor, best known for his science fiction novels and short stories. He was educated at Framlingham College, Suffolk, and West Buckland School, Devon, and served in the Royal Signals between 1943-1947. After leaving the army, Aldiss worked as a bookseller in Oxford, an experience which provided the setting for his first book, 'The Brightfount Diaries' (1955). His first science fiction novel, 'Non-Stop', was published in 1958 while he was working as literary editor of the 'Oxford Mail'. His many prize-winning science fiction titles include 'Hothouse' (1962), which won the Hugo Award, 'The Saliva Tree' (1966), which was awarded the Nebula, and 'Helliconia Spring' (1982), which won both the British Science Fiction Association Award and the John W Campbell Memorial Award. Several of his books have been adapted for the cinema. His story, 'Supertoys Last All Summer Long', was adapted and released as the film 'AI' in 2001. His book 'Jocasta' (2005), is a reworking of Sophocles' classic Theban plays, 'Oedipus Rex' and 'Antigone'.